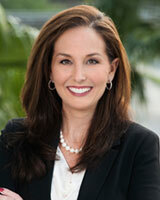 Christine A. Hearn - Tampa Full-Service Law Firm | Allen Dell, P.A. Christine Hearn is a shareholder with the law firm of Allen Dell, P.A. where she focuses her practice in the areas of marital and family law. Ms. Hearn confines her practice exclusively to Marital and Family Law matters. Litigation and negotiation of all family law matters, including property distribution, asset and business valuation, alimony, child support, complex tax issues, parenting plans, and timesharing arrangements.